HS was working hard on his new book at the weekend so to make sure he didn’t waste away I offered to cook. 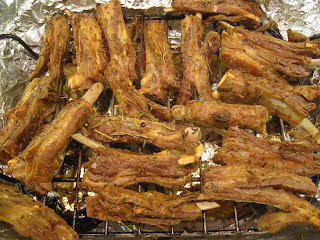 Inspired by last week’s recession special of Chicken Wings I thought I’d try that other cheap cut Breast of Lamb. The only restaurant where I’ve regularly seen this cut on the menu was at The Sportsman in Seasalter where Chef Stephen Harris prepares it in the Ste Ménéhould method. 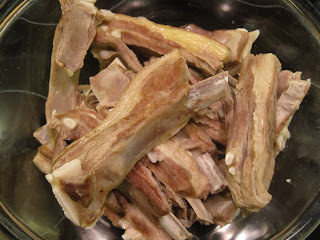 Lamb Ribs are fantastically tasty but quite fatty and need a fair bit of cooking (probably why they’re not served too often). To prep, the Lamb the ribs were thrown into a pot and with some Carrots, Onions and simmered for a couple of hours. 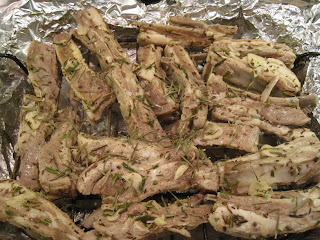 I did have fleeting thoughts of doing something more fancy but in the end I just mixed the ribs with chopped Rosemary, thinly sliced Garlic, Carraway seeds to add a little taste contrast, seasoning and some oil. Then into a medium oven for a couple of hours. The ribs still had a lot of fat on by the time they finished cooking but were so crisp and delicious and moreish that it was difficult to stop eating them. Which we didn’t, fuelled by the thought that the other Hermano might be getting more than his fair share. Unsurprisingly, we had horrendous indigestion which should put us off overindulging in this way again but probably won’t. The next day we went meat-free for all of, oh, four hours before HS said he was hungry and when was dinner. 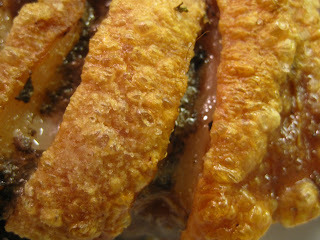 Luckily, I’d bought a joint of Pork – the seldom seen Hand and Spring. Basically, it’s the shoulder of Porky Pig with a bit of the belly. 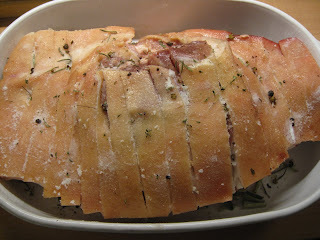 Usually it’s boned and rolled or braised but a straight roast is easier and this joint has so much fat and connective tissue that it’s virtually bomb proof – just shove in the oven and forget it. 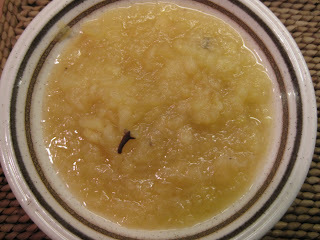 Apple Sauce, whole roast Garlic cloves and some greens (because we like our meals to be balanced). 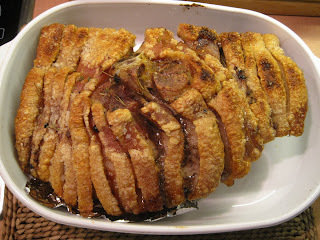 The meat is all dense and chewy and porky and quite like the meat of say, the Loin. We like to think we’re doing our bit along with the micro-slebs to help rescue the little fishies by eating as much meat as we can and I think quite a few were rescued at the weekend. Meat Free Mondays ? Bring it on. Breast of lamb features periodically on the menu at Casa Harters. Mrs H roasts the piece on a rack. It's more fun then being able to tear it apart. 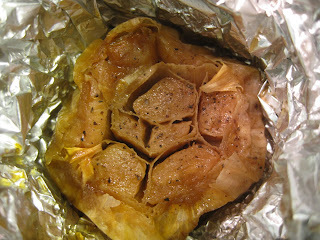 Although a lot of the fat runs off, it's still pleasantly greasy and just needs something simple alongside. My old butcher (when we HAD a real butcher round here..) used to say that the Hand and spring was the joint of preference for butchers, so much tastier than leg. Much like shoulder v leg of lamb I would think. How long did you cook the pork for btw? and at what heat? About 30 minutes at 220 then 4+ hours at 160. 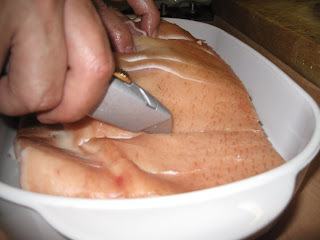 Took all the fat out after a couple of hours. I get the feeling it would have taken even an hour or two more. As the BG's said..."Grease is the word!" SurpriSingly not as the ling cooking means most is lost. Seems this meal knocked you both out for the ensuing 5 days-does this mean you have finally discovered your "meat limits" ? Not really we finished the leftovers the next day. Although we did have fish on Tuesday (see Coast post).